Acer rubrum 'Sun Valley' is favoured for its bright, colourful foliage and slightly smaller size than many other varieties of red or Scarlet Maple tree. In spring, slightly blueish-green leaves appear, then darken and in early autumn they burst into fiery shades of red and orange. 'Sun Valley' grows to approximately 5 x 4 metres in 20 years in an attractive, rounded flame shape. 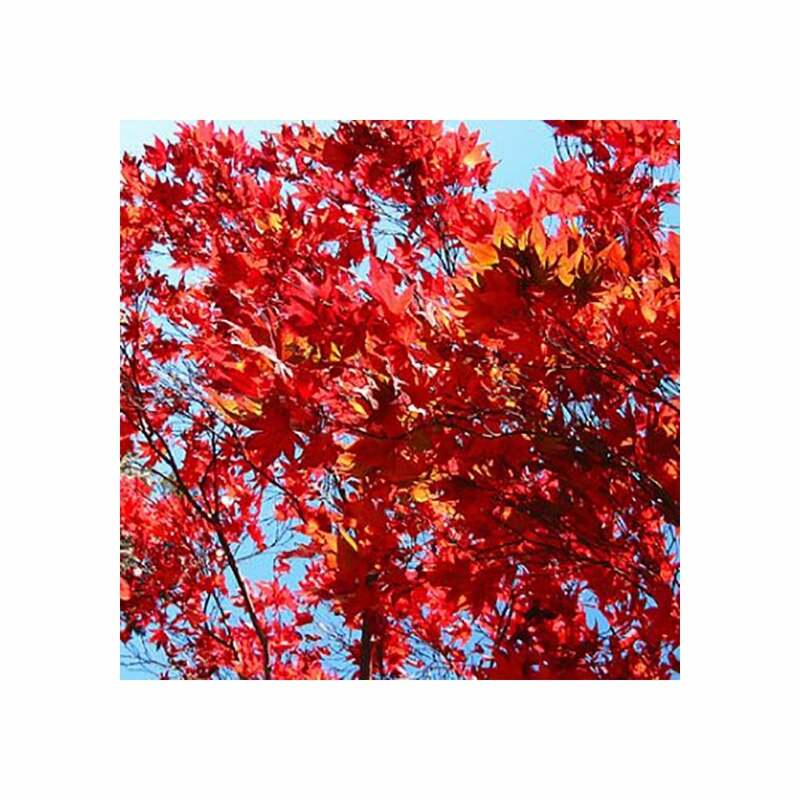 A cousin of the beautiful Acer rubrum Somerset, 'Sun Valley' is a tough tree that will grow in most soils that are moist but well-drained and can cope with occasional drought. It is suited to a a sunny position although semi-shade will also suit. With a pleasing shape and such vibrant autumn foliage, Acer rubrum 'Sun Valley' is a popular variety of Red Maple tree. Our pot grown 'Sun Valley' Red Maple trees can be planted at any time of the year. Prepare your planting site by removing weeds and grass within a metre of your desired planting hole. Dig a square hole as deep as the root mass and roughly 2x as wide. To help the tree establish more effectively, sprinkle root grow in the hole. We recommend planting 'Sun Valley' Red Maple trees with a staking kit. For single stakes, knock the stake in at an angle and use a buckle tie with a spacer to prevent chaffing. For more advice, visit the help section. If you’re planting 'Sun Valley' Red Maple trees in spring or summer, water well for the first few months. Increase watering if there are extended periods of hot or dry weather. If planting in autumn, you may only need to water a little. 'Sun Valley' Red Maple trees do not require regular pruning. If you wish to tidy up your Red Maple tree, do this during the dormant season. Focus on removing any damaged, diseased or overcrowded branches. If you require a clear trunk, remove any side shoots to help raise the crown.